My comparisons is between Koine Greek of the Septuagint and Hebrew of the Masoretic text. So perhaps i need to compare Linear B with Ancient Phoenician. 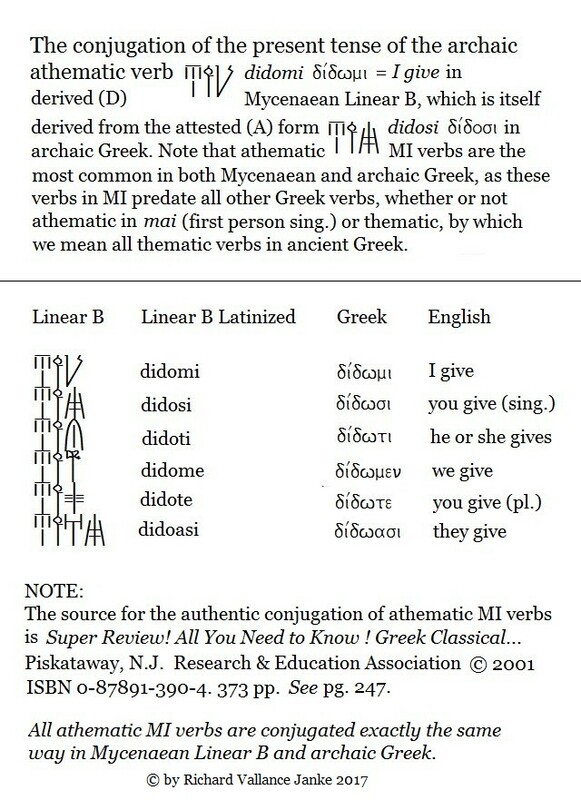 Di־Do־Mi = ת-ת-י " I Give"
Di־Do־Si = ת-ת-תה "You Give"
Di־Do־Ti = ת-ת-וֹת "He/She Gives"
Di-do-me = ת-ת-נו "We give"
Di-do-asi = ת-ת-ו "they gave"
Ethan, I have never seen you post on where Greek and Hebrew differ. Always on what you consider similarities between the two languages. The main differ are the length of the words. Ethan, I must congratulate you for acknowledging at least one difference between Hebrew and Greek. Someone naively looking at your posts might conclude that you are claiming that Hebrew and Greek are dialects of the same language. As I'd posted elsewhere, Hebrew personal pronouns have two forms, an independent form and a suffix form. The independent form is used as a nominative or subject, while the suffix form gets used for possession, preposition objects, and verb objects. Arabic has the same kind of pronoun inflection, and similar-looking pronouns. Greek pronouns' inflections, however, parallel noun inflections, noun cases and all. There are oodles of other linguistic evidence that shows that Hebrew is much more like Arabic than like Greek.